What is a responsive website? 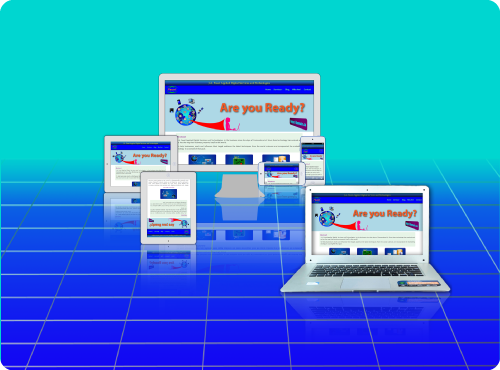 A responsive website is a site that responds (adjust to the size of the viewing screen) whether it is a handheld such as an iPod or a larger screen such as a desktop. To avoid confusion, a non-responsive web page that is designed for a large screen will do one of two things when viewed on a small screen. The page will either be proportionally scaled down to fit the entire small screen, forcing the user to zoom in, or forcing the user to scroll both horizontally and vertically. In either case, the user experience is compromised increasing the likelihood the user will terminate their browsing session on your page which defeats the purpose of having a webpage to promote your product or service. Content is to a web page viewport as water is to a container. You can't pour a gallon of water into an 8-ounce glass. But you can pour the contents of an 8-ounce glass into a gallon container. A web page that is designed for a large screen can have a lot of content and still hold user interest, that same content viewed on a smaller screen like an Ipad may become overwhelming to the user and you may lose them. Prior to 2014, it was a common practice among web developers to design web pages for large screens because the majority of internet users were surfing the web with large screen devices. After 2014 the inverse happened where the majority of internet surfers are using their smartphones and/or tablets.They are now the majority. According to the latest statistics, these users represent about 77% of the users. Building web pages for large screen display is now obsolete. The design strategy for building websites for small screens first provides excellent user experience and incorporating bandwidth consumption in the development of the site will mean quicker upload time and minimise the cost to the user for visiting your site because they are using less bandwidth. For a free consultation about the best plan for your online presence please go to the contact page and use the convenient contact form. Someone will get back to you.